You really have to be a music fan to remember the weird frenzy Klaatu caused when this album appeared in 1976. Certainly in Buffalo, where I was going to college at the time, this was the talk of the radio jocks and music mags. The buzz was that this album was secretly made by the Beatles. And since the Beatles were the subject of one of the greatest musical hoaxes of all time ("Paul is dead"), it was not much of a stretch to think this was another prank being pulled by some if not all of the Fab Four. 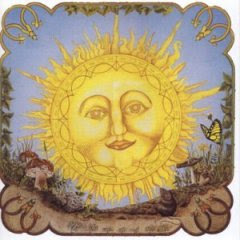 All the hallmarks for this rumor were firmly in place: no photos of any band members, no band members names, the song credits were credited to "Klaatu," and the intricate album artwork with all kinds of hidden characters (and its ever present brown mouse) fed the fuel of the raging rumor mills. For movie buffs, Klaatu was the robot played by actor Michael Rennie in the film "The Day The Earth Stood Still." Most importantly, the music sounded remarkably like Sargent Pepper/White Album era Beatles, especially when the single "Sub Rosa Subway" came out and it was prototypical Paul McCartney. The story of Alfred Beach, who invented the first underground subway, featured swirling harpsichords, Liverpudlian lead vocals and background harmonies, "laughing horns" (reminiscent of "All You Need is Love"), and smacked tubular bells at the chorus' echoing repetition. During the last 30 to 40 seconds of musical cacophony, you can hear Morse code being tapped out, and that was the Beatles cherry on the cake. "Sub Rosa Subway" sounded like a really good Paul McCartney song left off Magical Mystery Tour. Of course, the whole album sounded like a 60's psychedelic Beatles record, done absolutely beautifully, with the classic compressed drums in some parts, wide dynamics, masterful studio trickery, and all kinds of Beatles touches that were made for headphone listening. Klaatu kept their mystery for a few albums until it was discovered that they were a small group of fanatical Canadian studio musicians. Ironically, I don't recall any of their names. Below are some cool and bizarre video treats. First you have a well done homemade video about subway inventor Alfred Beach done to "Sub Rosa Subway." Then there is this super cheesy way-out homemade video done to the debut album's magnificent opening epic "Calling Occupants of Interplanetary Craft" (note: the song does start very quietly with the sounds of the outdoors and somebody moving through the brush), followed by The Carpenters (Yes! Karen and Richard) doing their truly kitsch cover from 1977 where you get to see Karen Carpenter floating in space and some alien dudes make a cameo. Oh baby, put on your tie-dyed shirts and space helmets and let's go for a ride!